Arsene Wenger says his hunger to win "every single game" as Arsenal manager has not diminished, in his 18th season in charge of the London club. 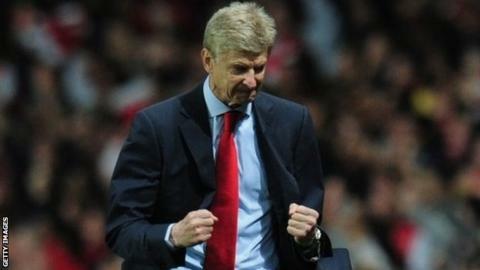 The 64-year-old has yet to agree terms on a contract extension, with his current deal set to expire next summer. "Certainly, I have a few more wrinkles now but what has stayed the same is the huge desire to win every single game," he said in an Arsenal Twitter Q&A. The Gunners currently lead the Premier League by two points. However, they suffered their first defeat since the opening day of the season at Manchester United on Sunday. Frenchman Wenger, who began his managerial career at AS Nancy in 1984, said he was still learning about management. "Every season you make wrong decisions. You have to go with your gut feeling sometimes, but you learn and analyse," he added. Wenger was also asked by Twitter users whether he had his own version of the "hairdryer treatment" - former Mancehster United manager Sir Alex Ferguson's famously confrontational method of addressing players. "It can only be an exceptional behaviour and every manager uses it," he said.